Hyperhidrosis treatment involves a set of measures on how to stop stinky and excessive sweating in the palms, foot, axilla and face. Read this article to the bottom and you will know everything you need to in order to combat this embarrassing health condition. 1.3 million Americans suffer from it, and approximately 3% of Asians are also affected. This is a condition that does not generally imply a severe underlying disease condition, but its impact is seen greater in the social lives of people. Hyperhidrosis or excessive sweating is a common medical condition that is known to affect a lot of individuals and the condition vary from one person to another person. If a person wants to get rid of this unwanted condition and stop sweating and start living there are certain procedures they should follow. Of course, excessive sweating is not by any means life threatening. But, it can cause a person into many embarrassing situations which they may find to destroy their confidence. This can make them to stay away or avoiding social functions. They may also be demotivated to develop romantic relationships or shake hands due to this problem. If not treated properly, the condition can lead to cause difficulties in ones day to day activities. So it seems, hyperhidrosis or excessive sweating is truly an embarrassing condition in one’s life. To start with, sweating is a healthy and a normal thing to happen to all human beings and there is nothing wrong with it. It becomes a problem only when too much sweating or excessive sweating happens. Excessive sweating is mostly seen among those who stay in warm weather, experience emotional stress, have been exercising vigorously or going through anxiety. It has been seen all the above mentioned reasons truly justify your sweating within a certain limit. As per various researches conducted in this area, people mostly lose a huge amount of body fluid in the form of sweat. It has also been seen that one small sweat gland can cool your body up to 1 degree F. People mostly dislike sweating because of the stains and pungent odor it leaves on their clothes. There are people who suffer from excessive sweating; they keep looking for ways on how to stop excessive sweating. Hyperhidrosis treatment or treatment of any disease begins with knowing what the disease is. This is a condition where there is excessive sweating in all or different areas in the body. It is more specifically classified into two: Primary focal hyperhidrosis and secondary hyperhidrosis. The primary focal variety is excessive sweating with no underlying disease conditions that could possibly cause it. It is called focal because it happens it one area in the body, it could be the palms, the soles of the feet, the axilla or the face. Secondary hyperhidrosis occurs as a result of an underlying disease condition. Here the excessive sweating could be a result of hyperthyroidism, spinal injuries, diabetes mellitus, and the like. So what if the person has it? If the person has the primary focal type, physiologically speaking there is not much to worry about. But if the person has the secondary type, then this definitely calls for medical attention. Going back to the primary focal type, as said on a physiologic basis, it doesn’t have a grave impact, but when the social and daily lives are affected it is the opposite. Most people with this condition encounter problems and difficulties emotionally and socially. Individuals view their condition as a limitation or hindrance in fulfilling certain aspects in their social lives: These include socialization, intimate relations, and self-esteem. Other than that, people who suffer from excessive sweating also experience certain limitations in completing tasks and activities of daily living. This is where the importance of the treatment becomes evident; most people think this condition has no treatment. This is a grave misconception because this condition can be treatable. Obesity: Obesity (excessive body fat) has become one of the most important factors causing excessive sweating. If you want to stop sweating then you need to first get rid of obesity. It is the metabolic activity within an obese that causes profuse sweat. In case, a person with minimum sweat has come up with excessive sweat off late, seek for medical advice as soon as possible. Menopause: This is yet another factor that has to be mentioned while discussing about how to stop sweating. Hormonal imbalance: Whenever your body shows any hormonal imbalance, your body would get subjected towards excessive sweating. However, people suffering from hormonal imbalance do not show permanent phenomenon of sweating. Coming of age i.e.puberty: Age or puberty is also known to cause excessive sweating. This symptom happens at an age of 13, 14 or 15. A person having excessive sweating on their hair and head find it very embarrassing to face the public. Most often the problem of excessive sweat in the head and hair leads to unnatural hair fall. These untimely hair falls worsen the situation even more. Also, excessive sweat makes a persons hair and head more oily and wet. You can find more grime and dirt in their hair. Another disadvantage is people with excessive sweat are prone towards exhaustion also. This is because when a person sweats, they tend to lose body fluids from their body. In order to get rid of these side effects of excessive sweating, the best thing to do is consult a dermatologist or a doctor. However, with the advancement of medical science, there are treatments available to cure excessive sweating. You can even find medications for how to stop sweating underarms. Sweating is an essential part of an individuals life; also it is a normal part of a body function. According to recent studies, around 8 million US citizens have been seen complaining about excessive sweating. There is no doubt that excessive sweating in the armpit or in head and hair is uncomfortable and embarrassing. It is found that the problem of hyperhidrosis has affected western people mostly and this is exactly why they have been more successful in finding cures and remedies on how to stop sweating and hyperhidrosis treatment. The diet of a person is also known to have a major share in creating excessive sweating. We all may be aware of the fact that our body sweats when it release various toxins in our body. So if your diet contains chemicals that produce more toxins, then you’re bound to get more sweat. 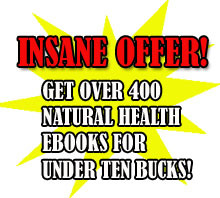 So, make sure that you eliminate processed foods or junk foods and foods that contain fat. Rather, stick to foods that contain high amount of vitamins, fruits, vegetables or whole grains. Also, make sure to consume sufficient amount of fluid i.e. water or fresh juice. By drinking sufficient amount of water your body temperature gets reduced and will prevent hyperhidrosis. Exercises also has various positive health benefits and therefore it is important to stay fit by doing regular exercises. Stress is yet another reason to cause this symptom. So think positive and follow various relaxation methods to reduce your stress level. An interesting fact about obese people is that,around two thirds of individuals on the planet are overweight right now and they are found to survive on an unhealthy diet. If you are among one of them, then don’t let it affect your life. Just go out and find proper cures and treatments to get rid of it. Just think how much relief you’ll get once you get your life free from obesity which would also be the best cure for how to stop sweating so much as well. Before treatment is employed, the patient must first undergo diagnostic procedures. 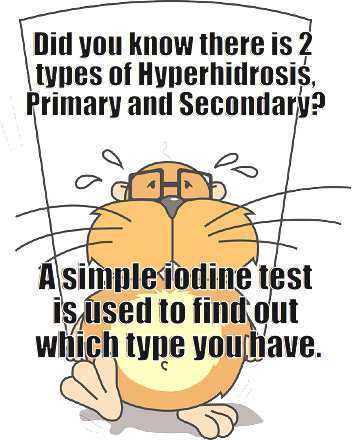 This is to confirm the type of hyperhidrosis. For primary focal, diagnosis doesn’t usually involve extensive laboratory tests. The excessive sweating can be assessed through a simple procedure called minor starch iodine test. This test would show the distribution of the sweat and what areas are they concentrated on. After confirming for primary focal hyperhidrosis, excessive sweating treatment then follows and these includes the following: Topical antiperspirants, systemic treatment, and non-surgical treatment. Topical: Treatment would involve the use of antiperspirants that have 20% Aluminum salts (hexahydrease) and 25% Aluminum chloride (xerac). Aluminum salts cause the sweat glands to be obstructed, leading to anhydrosis or the absence of sweat. 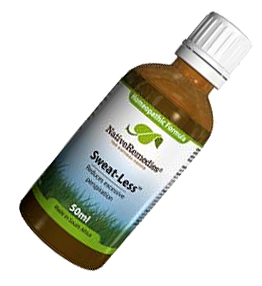 Using this long term would cause the sweat glands to degenerate thereby halting the production of excessive sweat. After application, it should be washed off after 6-8 hours. Reapplication of the topical antiperspirant must be done every 24-48 hours. Patients who use this product may experience skin irritation. This is a side effect of the topical agent and this can be managed by applying the topical antiperspirant on the affected area. Systemic: Systemic treatment usually involves the administration of anticholinergics. These agents decrease the sweating activity by inhibiting the nerve impulses that stimulate it. Oral anticholinergics include amitriptyline and glycopyrrolate. The administration of oral anticholinergics is facilitated by a physician. It is also important to discuss with your physician the proper dose of the medication and the possible side effects. Non-surgical: Non-surgical treatments involves Iontophoresis and Botulinum toxin. In iontophoresis, the feet and hands are soaked into water charged with an electrical current. The passing of the electrical current occludes the sweat glands, thereby causing it the area to stop sweating. This therapy is only effective to focal hyperhidrosis of the hands and feet, sweaty armpits might not be covered by this treatment. Intradermal injection of Botulinum toxin (BTX) is another way to stop the excessive sweating. Commonly called botox, BTX inhibits the nerves mechanism to stimulate the sweat glands to produce sweat. This type of treatment can be done in all parts of the body that are affected. Furthermore the effects of the Botulinum toxin are highly localized, only causing halt in the nerve signals where the BTX is injected. The solution to the problem of sweating too much is definitely simple, just ask your dermatologist on the different hyperhidrosis treatment.